Later seems to take a long time coming, so Nancy decides to explore on her own. She chooses a sturdy companion to help her discover the world: a great big tree. Tina Matthews leaves no doubt in my mind that Nancy is a fearless adventurer. Her journey from branch to branch takes Nancy close to the night sky and has me holding my breath, hoping nothing will go wrong. Being a mother of children who were once young, I think I’d be inclined to wait till they were old enough to discuss potential dangers before I shared Waiting for Later. 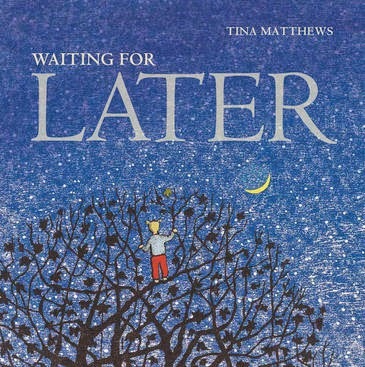 In the same breath, I suspect the adults reading this sweet little story about the frustration of waiting might feel a tiny twinge about the times they sent little ones away to amuse themselves. This multi-layered story for young and old is one that is full of the promise of later, while the joy of adventuring now is not underestimated.